Harvest Thins in Thai Sweet Chilli flavour are a powerhouse of energy; complete with 11g of protein, 2.5g of healthy fat, 8g of good carbohydrate, and a delicious sweet and tangy taste, packed in a 100 calorie (418kJ) individual package. This new crunchy snack is soy free, gluten free, dairy free, low glycemic, vegetarian approved, and kosher. A great savoury snack that satisfies your hunger between meals – that is quick and easy to get, while still curbing your desire for high calorie, high carbohydrate, and trans-fat laden chips. Each serving of Isagenix Harvest Thins supplies you with the fulfilling support you need to reach and maintain your weight loss goal while enabling you to build and maintain lean muscle mass. A totally guilt-free indulgence for any time of the day when hunger strikes. Isagenix Harvest Thins are a smart snack with a delectable flavour and available in convenient, carry anywhere packages. There are 10 individual packages of Harvest Thins in each box and they can be added to your auto shipment order or purchased as one-off orders. Cravings can happen to anyone. When you’re feeling hungry, but your next IsaLean shake is still a few hours away, Harvest Thins are a great option to keep junk food cravings at bay. These delicious, savory snacks are suitable for anyone who wants to live the Isagenix lifestyle. They are soy free, gluten free, dairy free, low glycemic, vegetarian approved, and kosher. What’s even better is that one serving is only 100 calories, so you can enjoy this delicious treat without any of the added guilt. Isagenix Harvest Thins are absolutely packed with all the nutrients your body needs to fuel your active lifestyle. One serving has 8 grams of good carbohydrates to give you the energy you need to power through your day. They also contain 11 grams of protein to build lean muscle and 2.5 grams of good fat to give you perfectly balanced nutrition. It’s hard to find a snack that is both tasty and nutritious. It’s even harder to find one that uses only quality ingredients. These Harvest Thins are an amazing option to check off all of these options on your wish list. They come in a tasty Thai Sweet Chilli flavour to satisfy your taste buds. Not to mention, they contain 0 trans fats and no hydrogenated vegetable oil, making them more heart-healthy than most high-protein snacks. When cravings hit, especially when you’re away from home, it’s crucial to have a healthful option that is easy to grab and go. Harvest Thins are individually packaged into 100-calorie servings so you can easily tear open a pack anywhere that hunger strikes. Instead of filling up on empty calories with no nutrition that will cause you to crash quickly, these snacks are a powerhouse of nutrition! 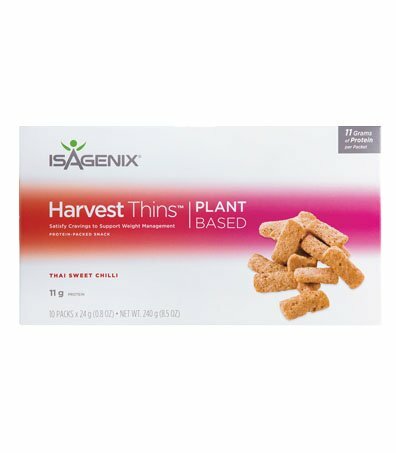 Flipping the script on the healthy snack market, Isagenix Harvest Thins not only taste great, but they’re high in protein, contain zero trans fats, and only have 100 calories per serving, making them the perfect guilt-free snack!